Marking the last LeBron 11 release of 2013, the LeBron 11 "Dunkman" drops on December 31st. This vibrant sneaker is the newest colorway from the popular shoe line for LeBron James and is expected to one of the best selling colorways for the LeBron 11. 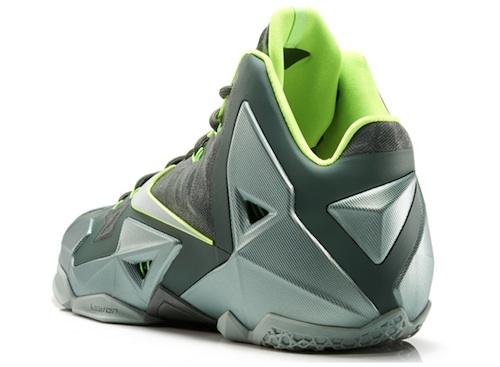 Like the other LeBron 11 releases, this advanced basketball sneaker employs a variety of features which make it lighter, but still supportive. A Lunarlon midsole offers additional support and allows the force of impact to be more evenly distributed, which can reduce pressure points. Nike Zoom cushioning brings the foot closer to the ground, increasing stability and allowing for a super-responsive feel. On the exterior of the shoe, Flywire uses nylon fibers to hold the foot in place and reduce slippage. The main part of the sneaker utilizes Hyperfuse construction with three layers of material. The base synthetic material provides supportive backing, while the mesh middle helps with breathability. Lastly, the top coating is made of Thermoplastic polyurethane and adds additional durability. View the full visual history of the Nike LeBron shoe line. Although many of the colorways that have been released feature colors that don't appear to work well together, the "Dunkman" manages to make the combination a success. The sneaker incorporates multiple shades of green, including Mica Green, Sea Spray, Dark Mica Green and Volt. 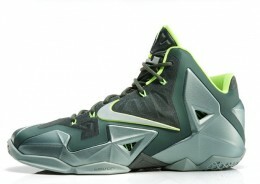 The "Dunkman" colorway has proven to be one of the most popular colorways for the LeBron shoe line and has been included in many of the previous versions. The LeBron 11 has made news lately because LeBron James has not been wearing the new edition of the shoe very often, preferring to wear previous editions. Nike is working to "redefine" the shoe more to James' liking. The high-end basketball sneaker retails for $200. Nike LeBron 12 XII What If Dallas Cowboys Royal Blue Silver 684593-410 DS Sz 12.